Don't let your company be the next grim headline . . . Cybercrime is on the rise -- and businesses large and small are at risk. For management, the question is not if you will be targeted, but when. Are you prepared? Is your enterprise actively monitoring networks, taking steps to understand and contain attacks, enabling continued operation during an incident? Do you have a recovery plan ready? Few are prepared, explains cybersecurity expert Ray Rothrock, who lays bare tactics used by hackers, vulnerabilities lurking in networks, and strategies not just for surviving attacks, but thriving even while under assault. 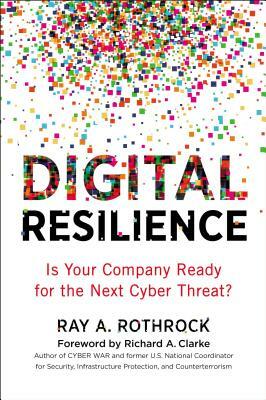 Fascinating and highly readable, Digital Resilience opens with the infamous 2013 Target attack, which compromised the credit card information of 40 million customers. In hindsight, the hack (like most today) was preventable. This book helps businesses: Understand the threats they face - Assess the resilience of their networks against attacks - Identify and address weaknesses - Respond to exploits swiftly and effectively Data theft. Downed servers. Malware. Even human error can trigger cyber events anytime from anywhere around the globe. This powerful guide provides the resilience-building strategies you need to prevail -- no matter what strikes. RAY A. ROTHROCK is CEO of RedSeal, a premier cybersecurity analytics platform. RedSeal's corporate customers span the finance, utility, technology, and retail sectors. Government clients include defense, intelligence, and civilian agencies.